EMC supports two-factor authorization (sometimes referred to as 2FA) for our forum accounts. It will add an extra layer of protection for your account by requiring you to type in a code generated by an app on your phone/device when you try and login, as well as your password. Typically, anyone trying to breach your account would not have access to your physical belongings, thus your account is likely to be more secure. This feature is optional, but we strongly recommend that you utilize it alongside good password practices. 2) Check the box to use two-factor authentication, and click "Add a New Key." 3) When you are using a smartphone or another device with an authentication app on it, scan the QR barcode that appears on the screen. 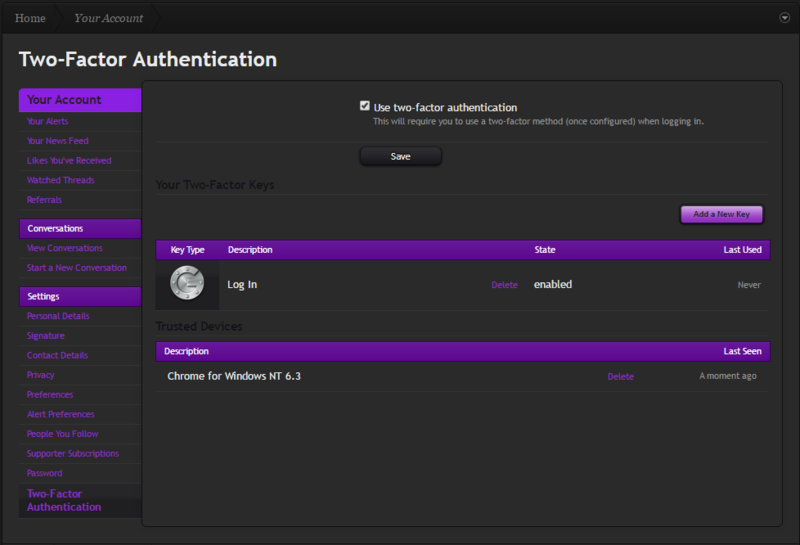 4) Type in the authentication code that your device will generate for you. 5) Click the "Attach" button. When you log in, the screen below will appear after you input your normal forums password. Use the code that your authentication app generates for you to log in. There is an option for you to ignore entering in this code from your device for 31 days. By default, this system supports 2 devices. Supporters have access to register 4 devices. EMC Staff members, who are required to use two-factor authentication for their accounts, have unlimited device registration. You are not required to utilize one particular authentication app. Shown in the example above is Google Authenticator, which is free and available on both iOS and Android devices. Consult your device's app store for more information.